A recycling truck picks up trash in Houston in this undated file photo. HOUSTON (KTRK) -- A contract deciding what company picks up recycling for the city of Houston was again postponed Tuesday after months of concerns and issues raised by city council members and rival companies. The $37 million, 15-year deal has been awarded to FCC Environmental twice after two rounds of "best and final offers" with city procurement and solid waste officials. It has been to the council twice. The trouble with the contract comes with how the company was chosen. At least two council members have complained about the wording of the request, more have complained about the scoring matrix that graded each company and the city controller cited an "unusual" amount of secrecy surround the deal. 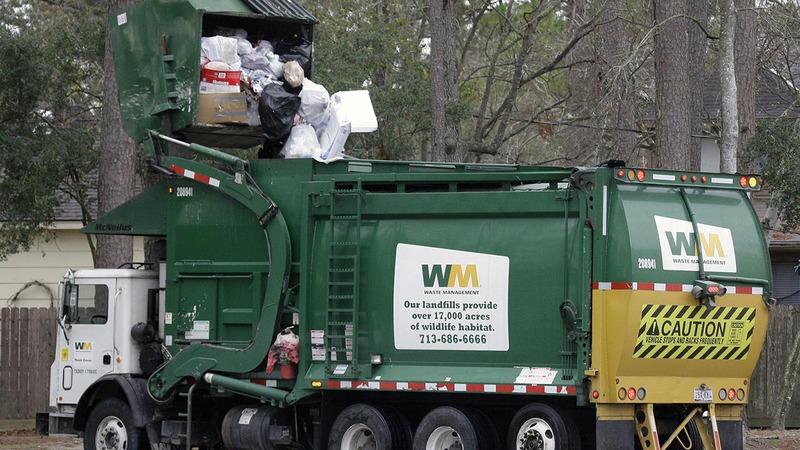 Tuesday, a representative from Waste Management, bid for the project, said despite that company's current role in the city and being the largest recycler in the world, they were ranked lower than FCC in the "experience" category. The first deal, $11 million more than the current deal, was awarded in June and set for approval in July before Mayor Sylvester Turner went back to the contract finalists for another final offer after the initial complaints from council members. This deal is a win for the city and the process sound, Turner said. In a letter Monday, city controller Chris Brown said the funds were available for the project, but still cited the transparency concerns around the deal. Brown held the contract up a week before, citing a number of concerns his office perceived. Council members Mike Kubosh and Steve Le tagged the item, pausing it for the rest of the year until the next council meeting in January.